KCUMB is investing in our men and women in military service by adding a new military track to the College of Osteopathic Medicine (COM) curriculum. This offering makes KCUMB one of only two osteopathic medical schools in the United States to provide this specialized program. The track is designed for medical students in the Health Professions Scholarship Program (HPSP). Beginning in Fall 2014, HPSP students will receive 20 to 25 additional contact hours of training each semester. Hands-on didactic experiences and lectures focusing on trauma, disaster life support, tropical diseases and post-traumatic stress disorder will make up a portion of the simulations and training. 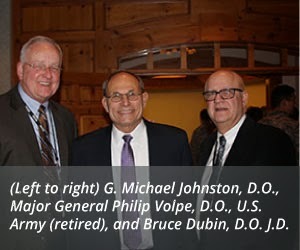 We recently announced the new track during a special presentation featuring Maj. Gen. Philip Volpe, D.O., U.S. Army (retired), former commanding general of the U.S. Army Medical Department Center and School in San Antonio. Volpe is a skilled and highly decorated officer who served as command surgeon during the Black Hawk Down incident in Somalia and on deployments during Hurricane Andrew relief in Florida and Hurricane Fran in North Carolina. He also served on the Joint Surgeons Operations Task Force in Haiti. This new track helps us fulfill our mission to care for the well-being of the diverse communities we serve, which includes our nation’s men and women in service. 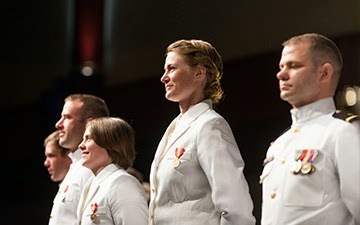 But more importantly, it will better prepare our students for a career in military medicine. Read more about our new military track on the KCUMB website. As part of the announcement of the military track, KCUMB students recently participated in a demonstration of Surgical Cut Suit, a wearable simulation suit that safely allows students to perform real procedures, such as surgical intervention, on a patient. This type of medical training device can help prepare students for military trauma situations. 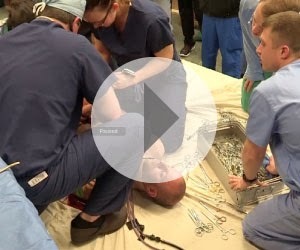 Click here to see a video of the demonstration at KCUMB. (Warning: Graphic content).